Spanish Stories = Cuentos Españoles | What's On My Nightstand? Angel Flores’ Spanish stories = Cuentos Españoles pulls together a choice sampling of short stories written in Spain and South America between 1335 and the 1950s. If you’ve yet to read Cervantes or Borges, their respective The Power of Blood (La Fuerza de la Sangre) and The Shape of the Sword (La Forma de la Espada) showcase beautifully the literary mastery of these gifted authors. Benito Lynch’s The Sorrel Colt (El Potrillo Roano) is a poignant, ironic gaucho-style tale from Argentina; Countess Emilia Pardo Bazán’s chilling The Revolver (El Revólver) is a 19th-century tale of psychological domestic violence. The first two pieces in this compilation, About What Happened To a Young Man and Lazarillo de Tormes will leave you with your mouth agape as you read these bawdy, rapid-paced stories published in the late Middle Ages and early Renaissance. 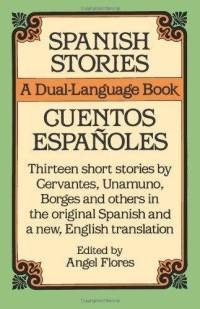 Whether you’re looking to improve your Spanish, need a short story for class, or want to delve into unexplored literary territory, this bilingual edition of Spanish stories = Cuentos Españoles is a top-notch compilation that doesn’t disappoint.